The Whiskered Screech Owls (Megascops trichopsis, formerly Otus trichopsis) are also known as Whiskered Owls or Spotted Screech Owls. 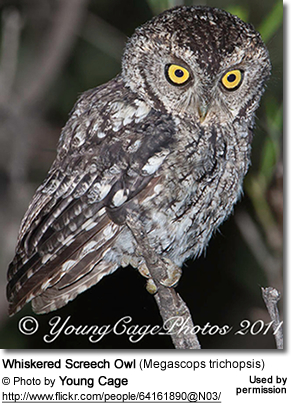 These small screech owls are endemic to North and Central America. In the United States, their range stretches from southeastern most Arizona (the Madrean sky island region) east to southwest New Mexico south through Mexico, Guatemala, El Salvador, Honduras, to north central Nicaragua. Within their range, they occur almost anywhere with suitable habitats, such as dense montane woodlands and forests, coffee plantations, as well as canyon forests near rivers or lakes, at elevations from 3,300 - 9,600 feet (1,000 - 2,900 meters) - although most common above 5,250.00 feet (or 1,600 meters). During the day, these nocturnal birds (active at night) typically remain well hidden in dense foliage, close to tree trunks. Occur naturally in the highlands of central Mexico, from Durango south to Veracruz, Oaxaca and Chiapas. Range: Southeastern Arizona south to northern Mexico - the states of Sonora and Chihuahua. Range stretches from southeastern Mexico (State of Chiapas) to north central Nicaragua. 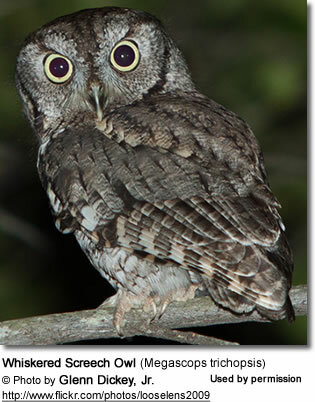 Whiskered Screech Owls measure from 6.9 - 8.3 inches (17.5 - 21 cm) in length - from top of the head to the tip of the tail. They weigh about 3 - 3.45 oz (85 - 98 g). Females are typically a little larger than males. They have round heads with prominent ear-tufts and distinct whisker-like extensions of facial disk feathers. They have, yellow-olive bills and feathered, greyish-brown toes. Their eyes (irises) range in color from golden to orangey. Grey phase: Plumage mostly grey with rusty tones. Facial disk is light greyish, with darker lines around the eyes. The facial disk has a blackish rim. The cere (nostrils / skin above the bill) and beak are dark grey.Red / Rufous / Brown phase: Brown or rufous-plumaged birds are most common in the southern (Latin American) portion of their range. 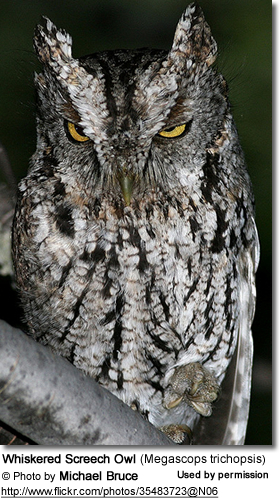 Resemble the Western Screech Owl, but are slightly smaller in size and have heavier barring on the chest. However, difficult to identify in the field and is most reliably done by their different calls. 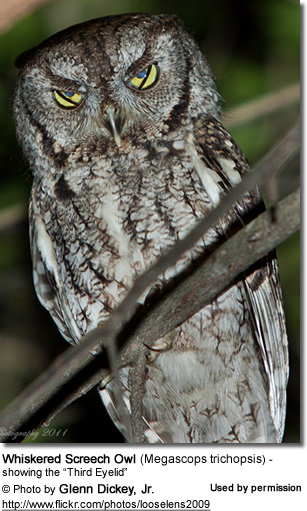 Whiskered Screech Owls are monogamous with pairs remaining together for at least one mating season. Most breeding occurs in April and May. The act of mating is preceded by a female's whistle and the male's telegraphic trill, and the actual act of copulation lasts about five seconds. Females lay 2 to 4 eggs per clutch; which are typically placed into a tree cavity or old woodpecker hole, about 16.5 - 23 feet (5 - 7 meters) above the ground. Males generally defend more than one nest cavity.Cavities that are not used for nesting, serve as roosts or food caches. The eggs are incubated by the female alone for about 26 days, while the male brings food to her. The hatchlings are completely helpless: blind, bare pinkish skin, white downy feathers, and an "egg tooth" on top of the beak, which functions to break open the eggshell. This egg tooth disappears within a few days of hatching. The male brings food to the nest while the female remains with the young until they are about one to two weeks old, at which time she also starts hunting. The young will try to catch insects when they are two to three weeks old, but initially unsuccessfully so. They will depend on their parents for food for four weeks or longer. The most common and recognizable song is a series of about 8 regularly spaced hoots bububububububub, mostly with emphasis on the third note, slightly falling in pitch at the end. The female's voice is slightly higher in pitch. Whiskered Screech Owls feed mostly on large insects (including grasshoppers, beetles, moths, crickets, spiders and caterpillars); but will also take birds, small mammals (bats, shrews, mice), reptiles, andterrestrial arthropods. They usually sit and wait until they spot a prey, then hunting them between branches or on the ground, holding them with their feet and bills. They also capture prey in flight. Any uneaten food is typically stored or hidden in tree cavities. Feeding usually happens a night or near dusk. They use their excellent hearing and night vision to locate their prey. These owls themselves, their eggs and their young are preyed upon by snakes (gopher snakes, green rat snakes), other birds (spotted owls, Cooper's hawks), mammals (coatis, raccoons). Nesting owls will bark at predators that come too close to their nests.